NOTE: Keyways allow for the easy alignment of shaped punches. 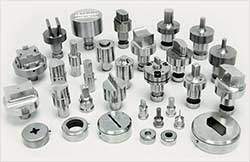 Controlled Automation shaped punches are produced with a 1/4″ wide by 1/8″ deep keyway. If machine brand is not stated no keyway will be provided. NOTES: Whistle notches allow for the easy alignment of shaped dies. Controlled Automation shaped dies are produced with a whistle notch. If machine brand is not stated no whistle notch will be provided. Dies with obround and rectangular holes are produced with the long dimension of shape parallel to flat unless other orientation is requested.